This month I want to continue the discussion about why aging in place is important. If you are like a lot of folks I’ve talked with in the past, you’re thinking, “I’m not old, yet. I have plenty of time to get ready.” Or, maybe you will decide to not think about it, so you don’t have to feel stressed about it. Your lifestyle, health and even freedom could be at stake if you don’t take the time to learn about (and act on) the things you can do to prepare yourself for later in life. For instance, I talked a little bit in the last article about some of the things that can change for you later in life that you should be ready for. Some of those might be physical, which can impact your life in many different ways. In this article, I want to talk about the real cost of not preparing for later life. Specifically, what it could cost you if you don’t get your home ready to live in it as long as you can. Probably the biggest danger we go into later in life unprepared for is falling. Statistically, your chances falling are far greater than being victim of a debilitating disease or even getting Alzheimer’s (or other dementia). On the other hand, more than 25% of people over age 65 will fall. So, you have a 17.9% greater chance of falling than you do of developing some kind of dementia. Falls also cost older adults $31 billion dollars. Which is just going to continue to climb as the 75 million Baby Boomers continue to grow older and get into that portion of their lives where falling becomes a very real issue. The truth is that several things can happen when you fall. Your overall health can be affected, which can affect your quality of life and shorten your lifespan. You can permanent physical damage, which could require you to use a wheelchair or walker the rest of your life. You will increase your chances of falling once you’ve fallen. You could lose your ability to live at home by yourself. If your overall health has been affected by a fall, it will increase your medical expenses for the rest of your life. If you can’t live at home anymore, you could end up spending $5,000.00 to $12,000.00 per month for assisted living or nursing home care. Think that doesn’t sound right? 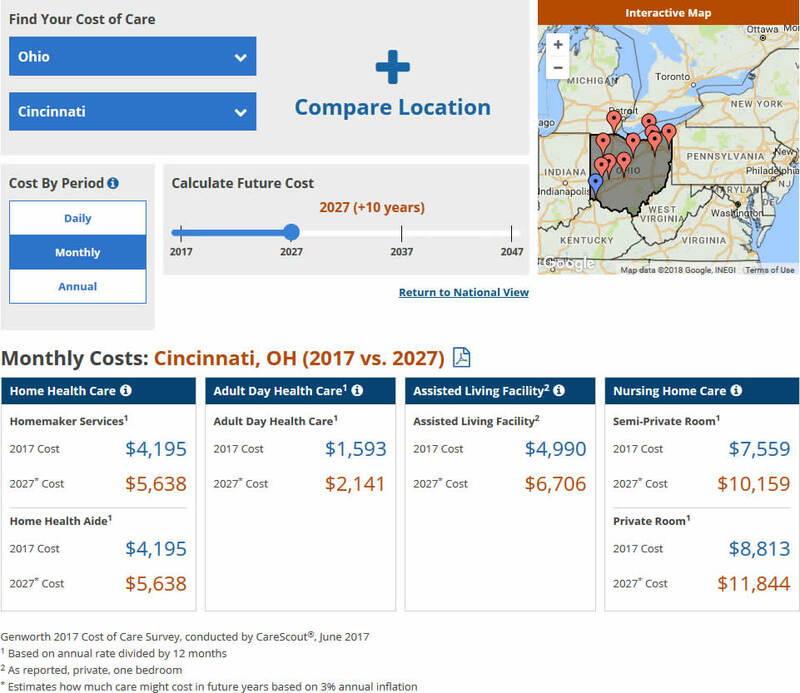 Here are the results from the latest GenWorth Cost of Care Study for the Cincinnati, OH area. If you take the initiative to plan for later in life, including getting your home ready, you could end up saving yourself a lot of heartache and money. 1. You could keep living life the way you want, instead of having to leave home. 2. You could spend $70k to $120k to remodel your home, but could end up saving money in the long run, since you’d make your money back on remodeling your home in a few years vs. paying for assisted/nursing home care. If you’d like to learn more about how to prepare your home, all you have to do is give us a call at (513) 677-0196.